From the skillet to the fridge. 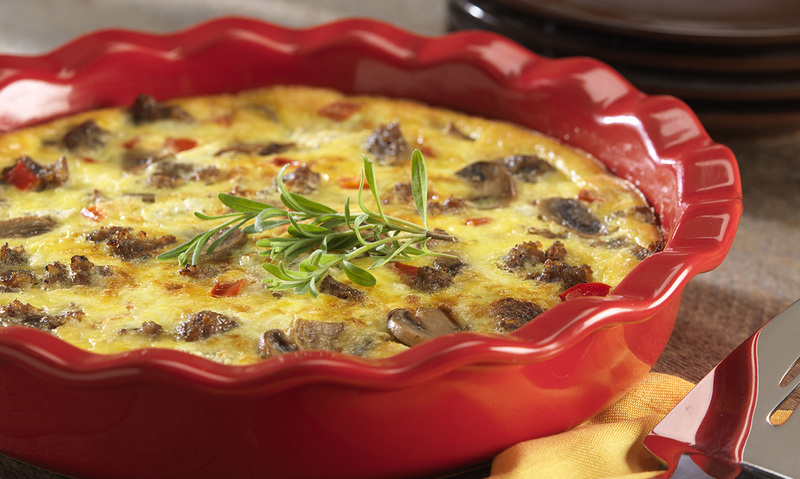 Just wake up the next morning, pop this sausage and egg casserole into the oven and enjoy. In large skillet over medium heat, crumble and cook sausage until browned. Drain on paper towels. In same skillet, sauté mushrooms until softened and browned. In a 9” deep dish pie pan, place sausage, mushrooms and red pepper. Crumble goat cheese on top. In bowl, whisk cream, eggs, mustard, salt and pepper until combined. Pour over sausage mixture in pie pan. Cover and refrigerate overnight. In the morning, preheat oven to 325F. Uncover pie pan and bake for 50 to 60 minutes until light brown and set in center. 1 In large skillet over medium heat, crumble and cook sausage until browned. Drain on paper towels. 2 In same skillet, sauté mushrooms until softened and browned. 3 In a 9” deep dish pie pan, place sausage, mushrooms and red pepper. Crumble goat cheese on top. 4 In bowl, whisk cream, eggs, mustard, salt and pepper until combined. Pour over sausage mixture in pie pan. Cover and refrigerate overnight. 5 In the morning, preheat oven to 325F. 6 Uncover pie pan and bake for 50 to 60 minutes until light brown and set in center.